Jigsaw is coming back to life once again, with Lionsgate moving forward on the eighth installment of their blockbuster Saw franchise. The Tracking Board reports that the studio has hired Piranha 3D writers Josh Stolberg and Pete Goldfinger to come aboard and write the script for this new movie, entitled Saw Legacy. No story details were given at this time, and it isn't known if Tobin Bell will be back to play the notorious killer Jigsaw. James Wan and Leigh Whannell, who came up with the original Saw story, are set to executive produce this sequel. We reported back in 2013 that Lionsgate was developing this Saw sequel, but that report claimed the studio wanted to take its time and develop the perfect story. 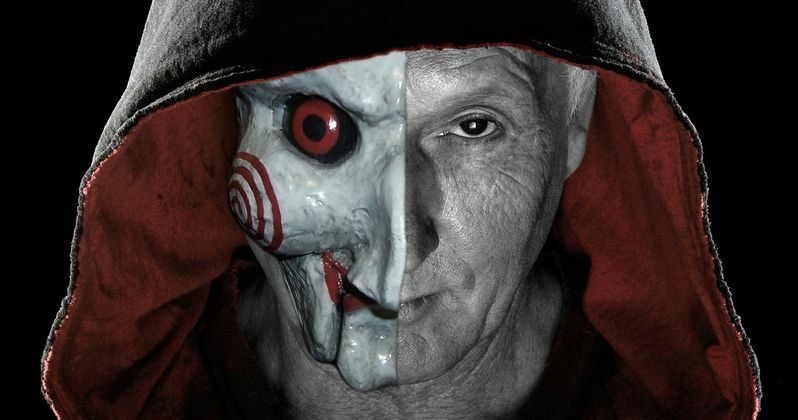 Lionsgate reportedly considered rebooting the franchise altogether, but it is not known if this new project will be a continuation of Jigsaw's story or not. The original Saw, directed by James Wan from a script he co-wrote with Leigh Whannell, earned an impressive $103 million worldwide from just a $1.2 million budget in 2004. The film spawned Saw II ($147.7 million worldwide), Saw III ($164.8 million worldwide), Saw IV ($139.3 million worldwide), Saw V ($113.8 million worldwide), Saw VI ($68.2 million worldwide) and Saw 3D ($136.1 million worldwide). The films have earned $873 million at the worldwide box office, with all seven movies costing just $64 million to produce. James Wan didn't direct any of the sequels, but he has remained on board as a producer as the franchise continued to churn out hit after hit. He most recently directed Furious 7 and will return to his horror movie roots this summer by directing The Conjuring: The Enfield Poltergeist, debuting in theaters June 10. Leigh Whannell most recently made his directorial debut with Insidious Chapter 3, which he also wrote and starred in. Josh Stolberg and Pete Goldfinger both wrote the Sorority Row remake and Piranha 3D together. Josh Stolberg has also written Good Luck Chuck and he wrote and directed indie films Conception and Crawlspace. What do you think about Saw Legacy moving forward?